There is a clear racial and partisan divide in opinions towards our nation’s police officers. No single group is anti-cop, but opinions differ in how police should engage with the communities they serve. 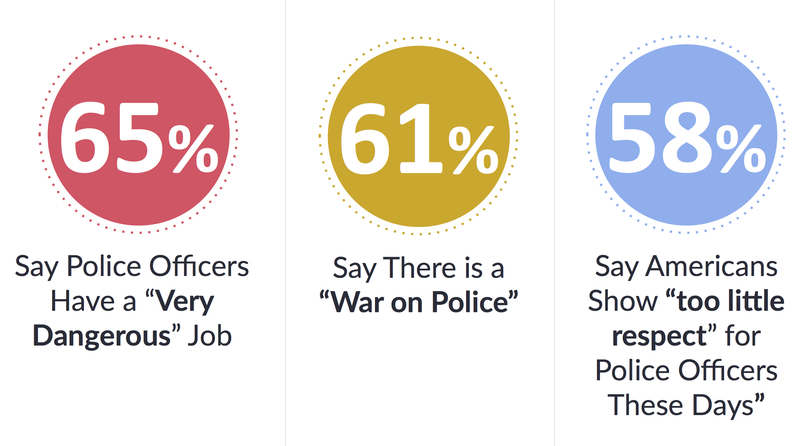 A recent PEW research study provides some interesting insight on the situation and support for police in America. While 68% of white Americans have a favorable view of the police, only 40% of African Americans and 59% of Hispanics have a favorable view. Attitudes have changed little since the 1970s when 67% of whites and 43% of blacks reported favorable views of the police. Racial minorities do not have monolithic attitudes toward the police. This report finds that Hispanics’ perceptions of police occupy a “middle ground” between black and white Americans’ views. Confidence gaps matter: Groups who feel less favorable toward local law enforcement are less certain they would report a crime they witnessed. For instance, black and Hispanic Americans are more than 20 points less likely than white Americans to say they definitely would report a crime. Research finds that when the police have legitimacy, the law has legitimacy, which encourages compliance and cooperation. Furthermore, it’s hard to argue that any group is “anti-cop” since no group wishes to cut the number of police officers in their communities and majorities are sympathetic toward the difficulty of police work. About 6 in 10 believe officers have “very dangerous” jobs. However, these groups diverge widely on whether Americans show enough respect for officers these days-64% of whites, 45% of Hispanics, and 34% of blacks say Americans don’t show enough. Police Tactics: African Americans (73%) are far more likely than whites (35%) and Hispanics (54%) to say that police are too quick to use lethal force. Similarly, African Americans (56%) are far more likely to say police tactics are generally too harsh, compared to Hispanics (33%) and whites (26%). Republicans (80%) are considerably more likely to believe that police only use lethal force when necessary, while 63% of Democrats think the police are too quick to use it. White Americans are more likely to believe accounts of racial bias in the system if they are predisposed toward empathy. Respondents who score high on the Sensitivity to Harm Index (SHI) are more than twice as likely to believe racial bias plagues the criminal justice system than those who score low (62% vs. 28%). Our look at public opinion and the perceived “war on police” offers lessons to criminal justice reformers. Many people have had good experiences with the police and don’t perceive systemic problems in policing. Such people might assume that citizens instigate conflict with the police. Some people greatly trust authority figures like the police whom they see as the ultimate linchpin of societal order. People with such experience and views of authority may see intensifying criticism of the police and impassioned calls for reform as an attack on police legitimacy, and thereby, law and order. As the APOA and our supporters seek to persuade fellow citizens, we should consider the implications of this analysis. Has our audience generally had positive or negative interactions with the police? Do they have a propensity to trust authority figures? If so, we should present evidence that speaks directly to these experiences and assumptions. Reformers might indicate their shared commitment to helping police to promote law and order. They can then explain how their reforms will accomplish these goals and improve police safety and police-community relations.